Set against the futuristic landscape of totalitarian Britain [and] tells the story of a mild-mannered young woman named Evey (NATALIE PORTMAN) who is rescued from a life-and-death situation by a masked man (HUGO WEAVING) known only as V. Incomparably charismatic and ferociously skilled in the art of combat and deception, V ignites a revolution when he urges his fellow citizens to rise up against tyranny and oppression. As Evey uncovers the truth about V's mysterious background, she also discovers the truth about herself and emerges as his unlikely ally in the culmination of his plan to bring freedom and justice back to a society fraught with cruelty. If I had to encapsulate my review in a single sentence, I would say that V for Vendetta gets an A for Anarchy, but an E for Execution. Politically, the filmmakers deserve five gold stars. They had the audacity to send a unapologetically incendiary anarchist political message to movie audiences throughout the modern world, one that most people in the left/right, liberal/conservative political mainstream may not want to hear, but need to hear. Technically alas, the filmmakers deserve to wear a dunce cap and sit facing the corner. They committed a critical blunder depressingly common among "auteurs." They became preoccupied with "style" at the expense of story. In doing so, they weakened the enormously valuable message they were sending. The A for Anarchy in a circle, usually in red and spray-painted on the background, is one of the most successful images among political symbols. It was created during the 20th century and is therefore a much more modern symbol than the classical black flag of anarchism. Its origin is not known, but there is evidence that the symbol was used by some anarchists during the Spanish Civil War and later by the Belgium organization AOA (Alliance Ouvriere Anarchiste). 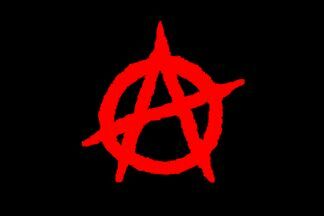 The Circle A is said to represent Proudhon's maxim that "Anarchy is Order." The "A" is for anarchy and the circle is either a symbol of order or represents the "O." But the Circle A is also said to be a symbol of unity and determination, forwarding the anarchist ideals and the inevitable rebellion against the rulers. Anarchists are devoted to the re-establishment of freedom for everyone and the importance of the cause cannot be affected by outer restraints. The circle is therefore, to some extent, a shield against the oppressive society surrounding the sovereign anarchist. The Circle A also lends support to the idea of international anarchist solidarity, where the circle encompassing the "A" for anarchy could be interpreted as a representation of the world. Anarchists are committed to the abolishment of all rule, coercive hierarchy and oppression--no matter where it exists. The unavoidable anarchist rebellion takes no prisoners and thus no tyrant is safe when the rebellion has begun. No matter the origin and the true meaning of the symbol, the Circle A is a very powerful symbol of anarchism world-wide. It is very often seen spray-painted on walls and under bridges or on the background of a black flag of anarchism. "Remember, remember, the fifth of November, the gunpowder treason and plot. I know of no reason why the gunpowder treason should ever be forgot." Those were almost the very first words he spoke to me and, in a way, that is where this story began, four hundred years ago, in a cellar beneath the Houses of Parliament. In 1605, Guy Fawkes attempted to blow up the Houses of Parliament. He was caught in the cellars with enough gunpowder to level most of London. Sometimes I wonder where we would be if he hadn't failed. I wonder if it would have mattered. I suppose the answer is in the rhyme. More than the man, what we must remember is the plot itself. For in the plot we find more than just a man, we find the idea of that man, the spirit of that man, and that is what we must never forget. This, then, is the story of that idea, of that spirit that began with an anarchist's plot four hundred years ago. There you have it, an explicit admission that the film is a manifesto for anarchism. As the patriot movement in America likes to say, "No Justice, No Peace!" As protest signs waved by the 500,000 to 1,000,000 strong crowd demonstrating against the ruling DPP's March 19, 2004 shooting hoax and March 20, 2004 election fraud declared: "Guan bi min fan, zao fan yu li!" (Officials have pushed the people too far, Revolution is justified!). But where does the "V" in V for Vendetta come from? As V explains, it comes from a Latin quotation, a motto: "Vi veri veniversum vivus vici. By the power of truth, I, while living, have conquered the universe." Proudhon, for the record, was wrong about property. Property is not theft. But Proudhon was right about anarchy. Anarchy is Order. Anarchy is not disorder. Anarchy is not chaos. Anarchy is merely "the absence of government." The absence of government does not equate with disorder. The absence of government does not equate with chaos. Quite the contrary. The absence of government is the blank slate, the tabula rasa, on which a spontaneous social order can emerge naturally and flourish. Government, not the absence of government, is the source of social conflict. As Bill McKay, the idealistic candidate in Michael Ritchie's 1972 political satire "The Candidate," observed, governments invariably "play off black against white, young against old, rich against poor." They always have, they always will. Governments in "advanced democracies" work only to the extent that a pre-existing social order permits them to work. Social order is not a benefit conferred upon society by government. Government is a disruptor of the spontaneous social order that emerges naturally in the absence of government. The way [the "Dao" or Adam Smith's "Invisible Hand"] never acts, yet nothing is left undone. Should lords and princes be able to hold fast to it, the myriad creatures will be transformed of their own accord. After they are transformed, should desire [the statist compulsion to micromanage] raise its head, I shall press it down with the weight of the nameless uncarved block. The nameless uncarved block is but freedom from desire [liberation from the controlling statist mindset]. And if I cease to desire and remain still, the nation will be at peace of its own accord. People rarely say exactly what's on their minds ... Especially when bringing up something painful, people often talk in circles until the other person figures out what they're trying to say. Good screen dialogue should avoid being "on the nose." Avoid having ... characters cut to the meat ... unless it's a climactic scene, and even then, load your words with hidden agendas. There almost always wants to be tension between what your character is literally saying, what your character intends to communicate and what your character is thinking. V for Vendetta is rife with "on the nose" dialogue, or perhaps I should say, on the nose monologues. In scene after scene, V talks up a storm, glibly explicating exactly what's on his mind, even though he is supposed to be an angst-ridden tragic hero haunted by his dark past. 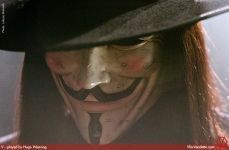 This groan-inducing syndrome is exacerbated by V's Guy Fawkes mask, which covers his entire face, including his mouth. As V rambles on endlessly, we don't see his lips move. All we see is his totally opaque, utterly static Guy Fawkes mask. The credits tell us V was played by Hugo Weaving, the talented character actor who portrayed the dastardly Agent Smith in "The Matrix" (1999, written and directed by Andy Wachowski and Larry Wachowski). But how do we know? We never see Weaving's face once during the entire 132 minutes of the film. For all we know, V was played by a stand-in, and Weaving dubbed the voicetrack afterwards. Given that the Guy Fawkes mask covers the actor's entire face, including the mouth and chin, the voicetrack wouldn't even need to be lip-synched! "I was Weaving's stand-in. In fact, I was V. I was the star of the movie. That was me behind the mask. Yeah, that's right. Weaving got sick the first day on the set ... from ... the catered food. The shrimp was bad. I didn't complain because Weaving and I were in Vietnam together. He sa ... I saved his life ... twice. Yeah, that's the ticket!" 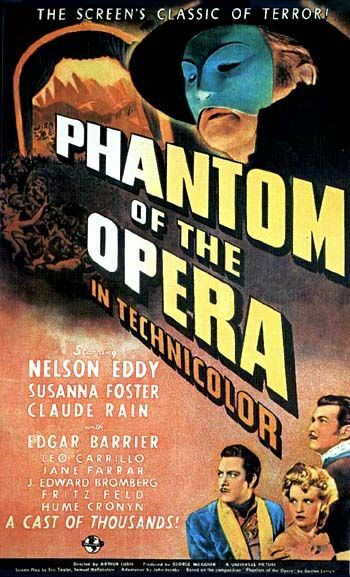 Contrast this with Erique Claudin's mask in the "Phantom of the Opera, (1943, directed by Arthur Lubin, adapated by John Jacoby from a novel by Gaston Leroux) which covered the upper part of lead actor Claude Rains' face, but not his mouth and chin. Doesn't that make much more visual sense? 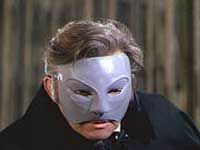 If for some reason the filmmakers objected to using a Phantom of the Opera style partial mask, they could have used a translucent mask. Movie audiences would then have been able to see Weaving's lips move as he spoke his lines, and gotten an indistinct but queasy impression of the horrific scars the long-sufferering hero had been left with. The gabby "on the nose" monologues and the deadpan Guy Fawkes mask undermine the film's effectiveness. But they are not the film's most serious problem. The film's most serious problem is its clunky use of flashbacks. Flashbacks can, if used appropriately, propel a film forward. But the flashbacks in V for Vendetta are constant interruptions that halt the film's foward momentum, weaken the film's thematic focus, and diminish the film's emotional power. Any device that diminishes a story's emotional power -- its ultimate payoff, its raison d'etre -- cannot possibly be considered a worthwhile artistic choice. Terry Gilliam's critically acclaimed but grossly neglected masterpiece "Brazil" (1985, directed by Terry Gilliam, written by Terry Gilliam, Tom Stoppard, and Charles McKeown) did a dramatically better job of depicting the Kafkaesque injustice of totalitarianism than V for Vendetta. Brazil, a highly creative variation on George Orwell's dystopian novel "1984," was in retrospect, uncannily prescient. Consider the following dialogue from the film. Do you think that the government is winning the battle against terrorists? Oh yes. Our morale is much higher than theirs, we're fielding all their strokes, running a lot of them out, and pretty consistently knocking them for six. I'd say they're nearly out of the game. What does this remind you of, but Ken Adelman's "Cakewalk In Iraq" and George Bush's "Mission Accomplished?" Brazil blew me away. I left the theater awestruck, wondering, "How did Gilliam do that?" 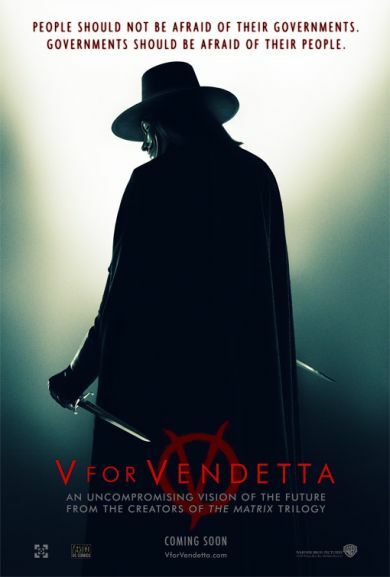 V for Vendetta failed to blow me away, even though I wanted it to and gave it every chance to do so. I left the theater perplexed, wondering "Why didn't the movie work better than it did?" Am I telling you not to see V for Vendetta? No, I am not. See the movie despite its defects. 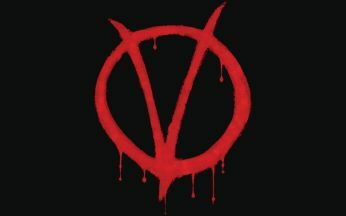 Assuming you are a libertarian, V for Vendetta's anti-authoritarian political message makes the movie worth seeing and worth supporting despite its botched execution. To turn media guru Marshal McLuhan's famed aphorism on its head, "The message is the medium." After all, how can one not recommend seeing a movie whose tagline is "People should not be afraid of their governments. Governments should be afraid of their people." 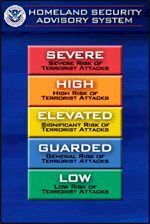 March 21, 2006 The United States government lowered the national threat level for the mass transit sector in August 2005. The country remains at an elevated risk, Code Yellow, for terrorist attack.